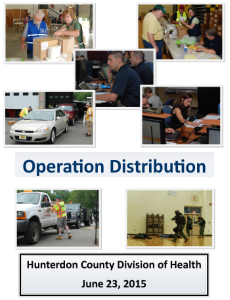 The Hunterdon County Division of Public Health, County Prosecutor’s Office, and the County Office of Emergency Management in collaboration with Mercer County Department of Health, conducted a full-scale emergency preparedness exercise on June 23, 2015. “Operation Distribution” incorporated multiple venues, including the Emergency Operations Center and the Rt. 12 County Complex in Flemington (HazMat Building and Building 1), High Bridge Police Department, and North Hunterdon High School in Annandale. The exercise was designed to test the county’s ability to distribute the medications doxycycline and ciprofloxacin during a public health emergency, such as a deliberate release of tularemia.